This was our second year attending the Desalpes Festival in St. Cergue. During the event we were able to watch the cows descend from their mountain pastures for the Winter. I love watching the farmers and their families take such pride in their livelihood and I feel so fortunate to be able to take part in such a typical Swiss tradition. 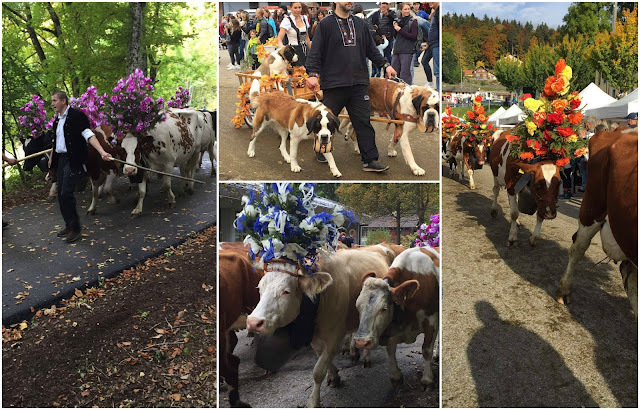 The town of St Cergue hosts the festival and the streets in which the cows walk through are lined with tents containing local food and vendors selling retired cow bells and other traditional Swiss fare. We purchased a couple cow bells (much smaller than the ones photographed below) with a plan to hang them outside the home as decorative accents once we return to the United States as a memento of our time living here. The town itself is a small country town with lots of charm. And during the festival there are several different options for food and drink. And for the children there is a inflatable jump house and a roped off area for riding child sized tricycle tractors. For full photo and video album of our trip to the St Cergue Desalpes Festival 2017 Click Here.